So how do you entertain your clients on days of incessant rain when every creature from ants to zebras have entrenched themselves in the deepest cover to avoid the deluge? Or on those nightmarish days of bright sunshine when nothing is moving, not even a mouse…. In an attempt to answer this question I came up with the idea of sharing some of the wonderful, occasionally weird, but always interesting plants and animals in whose space we work. I hope this series of monthly blog spots will not only help to fill rainy days with your guests but will also inspire you to delve deeper into the marvels of our remarkable natural heritage. ﻿Whilst the extinction of the dinosaurs ended the rule of reptiles and ushered in the era of mammals, in sheer number terms our planet is currently very much the domain of insects. 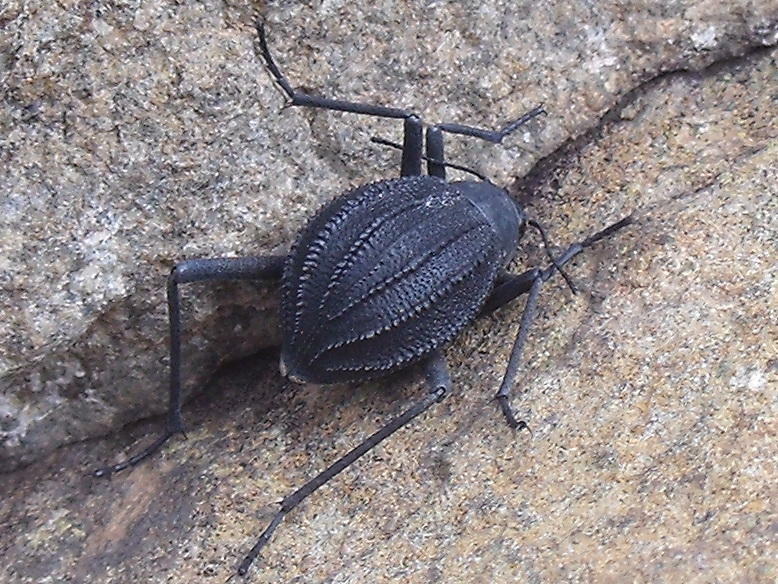 Three quarters of all living species on earth are insects, amongst which the beetles (Order: Coleoptera) reign supreme. 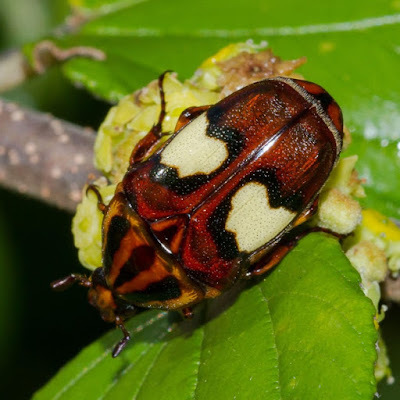 Glossy and colourful the Fruit Chafer (pictured above) males have developed an interesting, and energy efficient, strategy for attracting females. They congregate in ‘juice-bars’– created when damage to the bark of a tree results in sap flows. Favourite ‘hang-outs’ are the Buffalo Thorn (Ziziphus mucronata) or the Velvet Bushwillow (Combretum molle). Competition is fierce as the males jostle with one another to be able to mate with the females who are attracted to the sweet juice. Winner takes all. brainchild of humans – think again! Beetles also understood the tranquillising effects of chemicals many moons before humans did. Ant’s guest beetles (Subfamily Paussinae) produce a glandular secretion on their antennae and body that is highly sought after by ants. As the name suggests upon finding an ant colony these beetles invite themselves in as guests, albeit through drugging and subterfuge! The glandular secretion they produce - which is so sought after by the ants that they will actually lick it off the beetle - contains a volatile substance which appeases them and suppresses their usual antagonism towards intruders. This tranquillising effect, combined with the beetle’s ability to use an acoustic mechanism to successfully imitate the sounds of an ant queen, permits them access to the nest without alarming the colony. In return for their ‘drug fix’ the ants feed the beetle and its larvae. 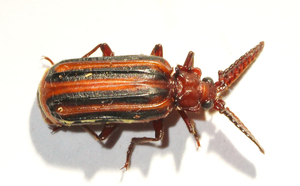 In some instances however the beetles are less altruistic and their larvae feed on the ant brood…perhaps ‘deceptive diners’ rather than ‘sneaky guests’ on those occasions. And last, but by no means least, are the rollers of the beetle world. Dung beetles evolved at least 65 million years ago as the number and size of mammals (and their droppings) was increasing. Specially adapted to working in and with dung these remarkable creatures have been cleaning up our planet for millennia. There are some 6,000 species world-wide of which only 10% are rollers. 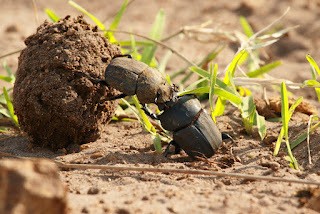 More correctly called Telecoprids these beetles roll away the dung they collect from the dung pat. This behaviour is thought to have evolved from competition for dung amongst the many species that arrive at fresh dung. Thousands of dung beetles may arrive at a single Buffalo pat within an hour, so its gets crowded, fast. Removing your portion not only reduces onsite crowding and competition but if you have already ‘scooped your poop’ and are making a quick getaway you also have a better chance of keeping hold of your spoils. That said, whilst on drive a few weeks ago I witnessed the ‘rock’ to accompany the ‘roll’ in the Telecoprid world. A male was happily rolling his ball of dung, climbing atop it every couple of minutes to orientate himself, when in flew an interloper. The interloper then proceeded to also climb onto the ball and rock it aggressively in attempt to knock off the rightful roller. A fascinating fight ensued with the original owner eventually regaining ownership of his ball and rolling it off. Very nice article, thanks for the discussion.